If I could tell you one thing to learn to make, it'd be soup. Hear me out dude... Soup is one of those things that is hard to mess up. 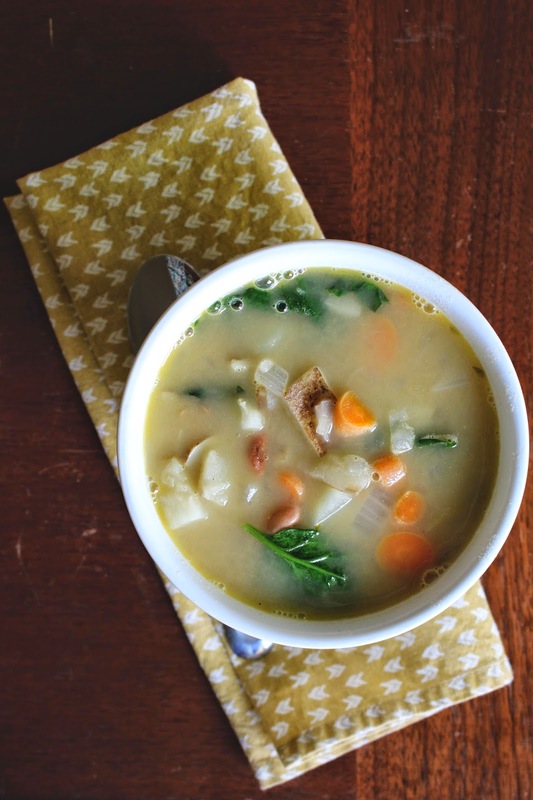 Once you know how to make one soup, you pretty much know how to make them all. Kind of like salad. You can improvise and get creative with it. Basically, it's the opposite of baking. If you are a new chef, steer clear of the baking. Stick to the soup! Kidding... try whatever your little heart desires. But I promise, you'll succeed at soup. It's a confidence builder in the kitchen. 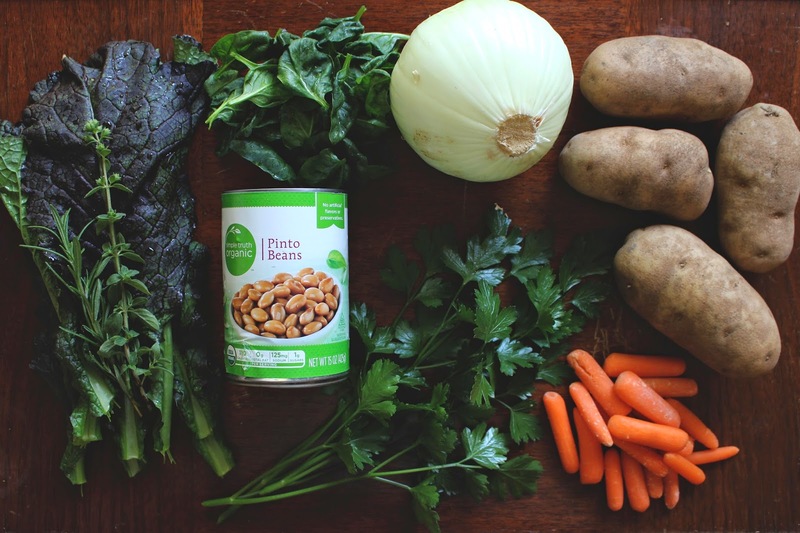 For this particular soup, you will need: Broth (we used chicken), Potatoes, Carrots, an onion, a can of beans, or two, some lettuce and some herbs. You'll also need olive oil, salt, pepper, crushed red pepper and cumin. Side note, cumin is absolutely, without a doubt, my favorite spice. I'll get particular about measurements in the recipe portion below. 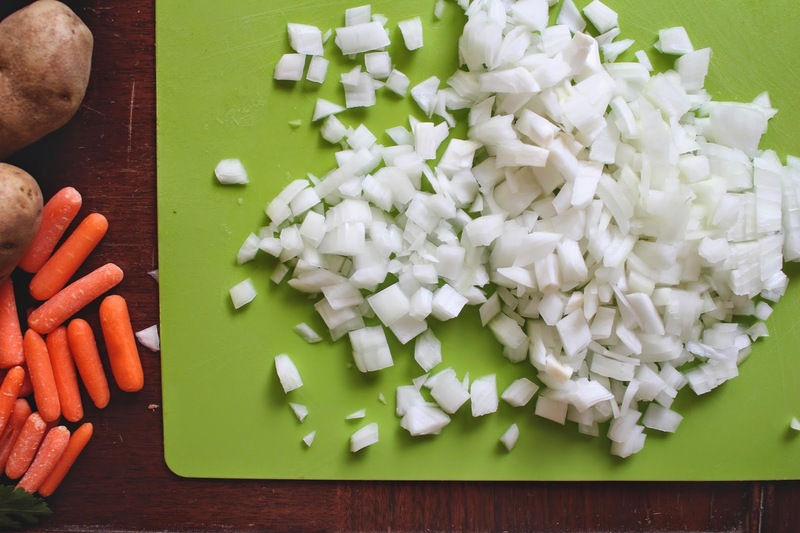 Chop up your potatoes, onion and carrots. We left the skin on the potatoes. 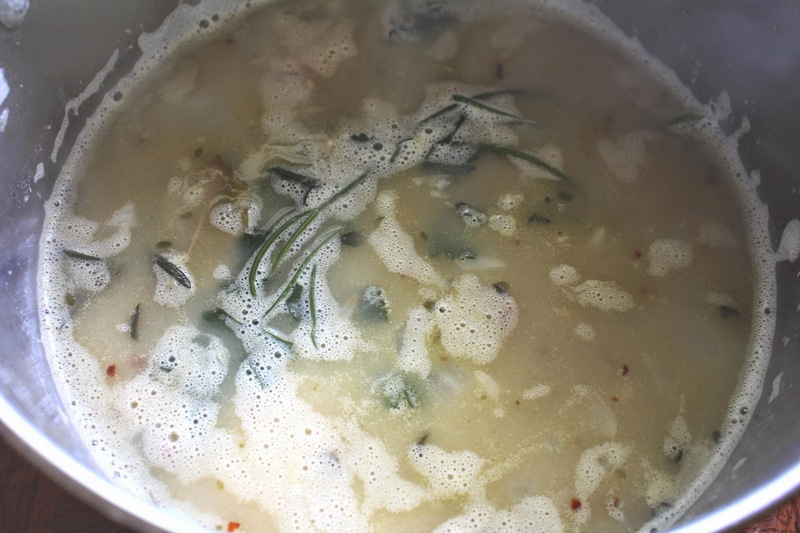 Add your olive oil, onion and herbs in a soup pot. I tied my herbs up together so I could easily remove them later. You could chop them up and just leave them in the soup. Ain't no thang either way. 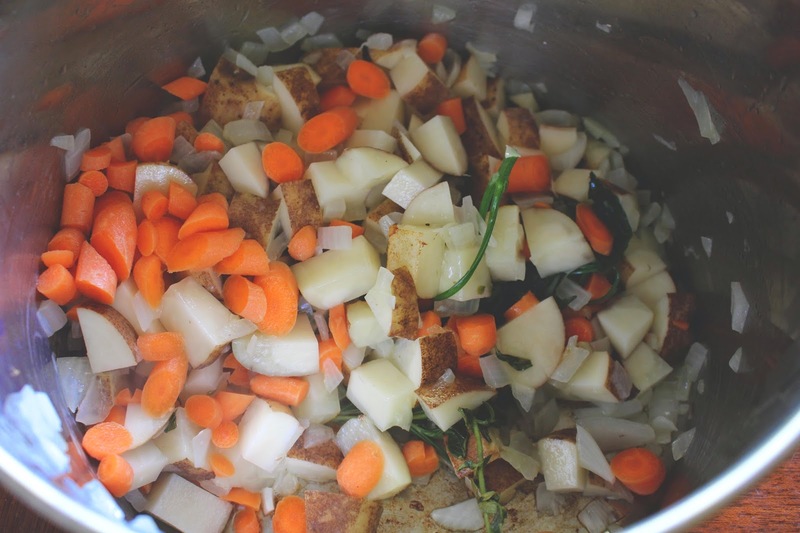 After the onions are translucent, about 10 minutes, add the potatoes, carrots and remaining seasonings. Toss to coat everything. Add the broth and beans. Bring the soup to a boil and then lower it to simmer. 1. Heat olive oil in a soup pot. 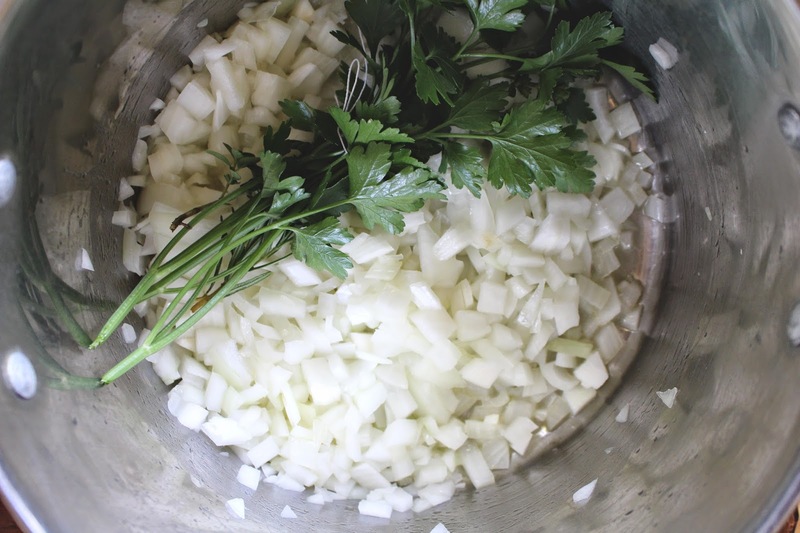 Add chopped onions and herbs. I tied all of my herbs together for easy removal later. You can chop yours up if you'd prefer that. Cook for 10 minutes. 2. Add diced potatoes, carrots, salt, red pepper, cumin and black pepper. Stir to coat everything with the seasonings. 3. Add chicken broth and bring to a boil. 4. Add beans and bring back to a boil. Then reduce to simmer. 5. Cook for about 20 minutes until the potatoes are pierced easily with a fork. 6. Remove herbs. Taste test and add salt and pepper if needed. 7. Add spinach and mustard greens. Cook for about 5 minutes. 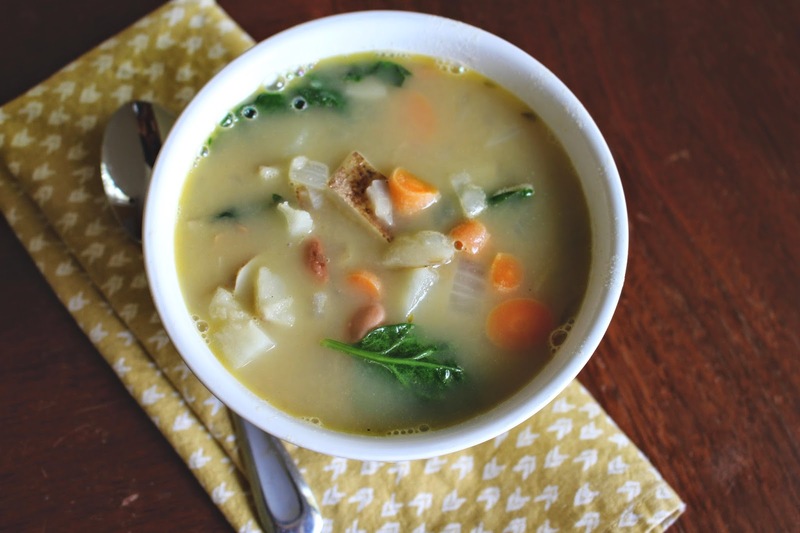 This soup is basically a result of things we had in the cabinet and what was ready for pickin' in the garden. And THAT is exactly why I love soup so much. Do it. Learn soup. It won't fail you.